Weekly Update 2019-07: Genre-hopping superstar musician Beck, the joy of documenting the human condition and Isaac Asimov's non-fiction writing. I have a complicated emotions about the life choices of a lot of musicians I like, and I try to be upfront with myself about the duality of human nature through this subject. Multiple award-winning singer/songwriter Beck is one such example, writing several decades-worth of some of my favourite music with intricate lyrics, simple-yet-inescapable melodies and collaborating with other huge names in the music industry. At the same time, he's a self-professed scientologist. With everything I know about scientology, its soul-sucking tendencies and reliance on celebrity spokespeople to keep its popularity, I am ashamed that someone as obviously intelligent and talented as Beck would choose to associate himself with a cult. But it's great music. I'm especially excited that Cage The Elephant are going on tour with Beck, Spoon and Sunflower Bean this summer. What I really like about Beck is that he constantly reinvents himself like Prince or David Bowie. He's covered a wide variety of sub-genres, and I appreciate his take on lots of different styles. Check out the first album I heard from Beck, back in my elementary school days: 2005's Guero. It's a sort of Tex-Mex Spaghetti Western feeling. I accepted a second BrainStation one-night workshop at the last minute, and then later found out that it would be an online webcam class - a little nerve-wracking to realize I'd be addressing a bunch of faceless, voiceless chat names for 90 minutes of User Interface basics. But it was pretty cool, and BrainStation even has a cute little room for these workshops so I can present with a cool designy-looking backdrop and good acoustics and such. Plus the fourth floor of campus has Perrier - I had never been up there before! Also speaking of BrainStation, I'm almost finished marking all the first assignments of this semester. Yep, we're almost halfway through already. Between you and me, I'd actually have finished marking on Sunday but some students asked for an extension. I'm cool because I gave it to them (with a warning that I'll be holding them to a higher standard for marking). As per last week's update, I had an amazing experience at ElleHacks and wanted to shoutout Vena for sponsoring such a great initiative. So I took Friday afternoon to whip up a work-appropriate blog post on my experience and Vena's women-supporting initiatives. I'm hoping we can start our Medium presence at the company and share my post this week - though that may be a little ambitious. On Saturday, I'm going with some friends to Blue Mountain - I don't think I've ever been there before. I'm definitely not a skiier, but I'm excited to be out in the wilderness. Hopefully the weather will give us a break. I've professed on numerous occasions on this blog that I am slightly obsessed with user behaviours and motivations. I'm detail-oriented (often to the point of my demise) which suits me quite well for my role in user experience design. No decision is made without an understanding and examination of the way it will be used, everything is logged. I've been thinking about the connection between this love of user behaviour and my other great love: documentary film and television. It combines my talent for being a couch potato with my love to learn things and examine weird sides of life. I try to visit Bloor Cinema every now and again to take in a good doc, and most of my binge Netflixing is documentary series like Explained and Chef's Table. This love of documentation has blossomed into the creation space in my brain, especially in my recent need to capture photos of things I do. I don't really share them on social media too often, I prefer to keep them for myself to look back on. And I actually do look back on them sometimes. This isn't a candid Shani photo - those aren't for the online world. Facebook certainly contains some of these photos, but what about my mother? Lately I have been thinking about how I don't have nearly as many photos of her because she doesn't use social media. She also hates having her photo taken, so sometimes I take photos of her when she's not looking. Those are the best. No one sees them but me (and probably her, since I know she will read this and ask me for them). It also makes me laugh because the roles have definitely become reversed: my dad used to take photos of me all the time as a child when I didn't want my photo taken. But I'm happy to see those photos now. The documentation we capture is our personal legacy; it is how we will be remembered. So it is in life, it's actually the same way at Vena. Documentation is something many engineering departments struggle with, but it's really important work for the people who pick up the work you leave behind when you leave your current position. As relating to user behaviour, I think we have this vain notion of wanting to be remembered after we're gone. We have to leave something behind to be remembered (out of sight, out of mind), so why not some well-written, captured or filmed documentation? 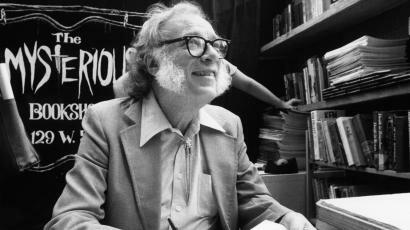 I have been a big fan of Isaac Asimov's science fiction since I discovered the 1999 movie Bicentennial Man was based on his 1976 novellette of the same name and later 1993 novel The Positronic Man. Yes, I have fond memories of cutting printer paper into fringes and taping them to my cheeks for a grade ten book report presentation...though there is gladly no photo evidence of such an event. He certainly crafted a specific look. I love a good bolo tie. The jobs that will disappear will tend to be just those routine clerical and assembly-line jobs that are simple enough, repetitive enough, and stultifying enough to destroy the finely balanced minds of those human beings unfortunate enough to have been forced to spend years doing them in order to earn a living, and yet complicated enough to rest above the capacity of any machine that is neither a computer nor computerized. It is these that computers and robots for which they are perfectly designed will take over. The jobs that will appear will, inevitably, involve the design, the manufacture, the installation, the maintenance and repair of computers and robots, and an understanding of whole new industries that these “intelligent” machines will make possible. This means that a vast change in the nature of education must take place, and entire populations must be made “computer-literate” and must be taught to deal with a “high-tech” world. 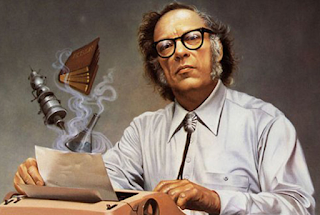 I think Asimov may have predicted my future...it feels weird to be seen. I do believe that the best science fiction comes from a place of truth and logical thinking, a depiction of what our all-too-soon future could be with the advents and diparagements of technology in modern society. Science fiction, while made-up, is a lens through which we look at our current lives and the way real, true science might shape our futures. For that reason, I think Asimov is probably a fantastic non-fiction writer and I look forward to exploring that side of his work. After all, I could use a mentor in the world of non-fiction writing. By the way, is it spooky that Asimov died almost exactly a year before I was born?